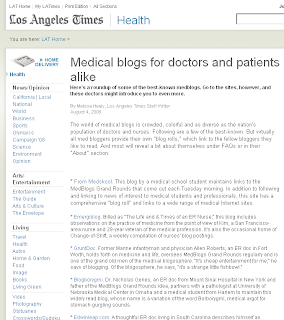 Medical blogs for doctors and patients alike. LA Times. "Clinical Cases and Images. A teaching blog with a comprehensive collection of cases in all areas of medical specialty." I have mentioned several times before that ClinicalCases.org is not a blog but a collaborative attempt to build an online case-based curriculum of medicine. CasesBlog is the blog I started in March 2005 (3 years ago) to collect ideas, interesting stories and post relevant news about the Clinical Cases and Images project. However, the LA Times coverage of the medical blogosphere is relatively well-measured and I am not going to complain too much about an occasional misclassification, especially when featured among some of the "grandfathers" of the medical blogging world such as Kevin, M.D., GruntDoc, and the former president of the SGIM Robert Centor. "Just under my desk again to do voiceovers. A very large, but dead, insect was waiting for me. Always good to have an audience." This video shows that it takes about 2 minutes to start a blog on Blogger.com, a service by Google. Doctors talk shop on medical blogs. LA Times. Online medical blogging: don't do it! CMAJ • July 29, 2008; 179 (3).